Bill Deal began his musical career as a backup musician on studio recordings, including Jimmy Soul's 1963 hit "If You Wanna Be Happy," a Calypso-style tune written and produced by Norfolk’s Frank Guida. 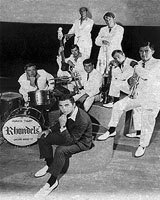 By 1965 Deal’s own band, The Rhondels, had made a name for itself throughout Hampton Roads Virginia and northeastern North Carolina. Deal played keyboard and sang lead. Other band members in the early days included Mike Kerwin and J. T. Anderson on guitar, Don Quisenburry on bass, and Ammon Tharp on drums. So many outstanding horn players joined up that at one time the “septet” had as many as 12 members and the brass players – among them, Jeff Pollard, Ronny Rosenbaum, Ken Dawson, Gary Hardy, Kenny Copeland, Raleigh Ligart, George Bell and Ron Hallman – took turns playing gigs. Maurice Williams' "May I" was a stock number for The Rhondels, so much so that the group became bored with it. A request for the piece one April night in 1968 at Virginia Beach’s Peppermint Lounge inspired Deal and Hardy to break the monotony of the piece by reworking it to a polka-like beat. They recorded the new rendition the following day at Warren Miller’s D’Arcy recording studio, with Ammon Tharp singing lead vocal. The song was picked up by Philadelphia producer Jerry Ross and reissued nationally on the Heritage label. “May I” made it to the Top 40, followed by a string of other hits including renditions of the Tams’ "I've Been Hurt" and "What Kind of Fool (Do You Think I Am)." The Rhondels’ musical style has been called Beach, Blue-Eyed Soul and Middle of the Road. Whatever the genre, the best description of their music is “eminently danceable,” as longtime fans and new ones from the Carolinas to the Chesapeake Bay can attest. Try to keep your feet from moving when The Rhondels take the stage.